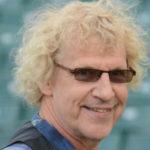 Smoky Greenwell was born in Michigan on the 4th of July 1951, reared in Delaware, and schooled in Spain and Tennessee. 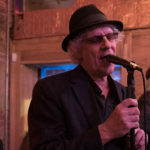 Greenwell learned harmonica in earnest in the mid-1970’s by sitting in with the venerable blues masters Furry Lewis, Piano Red and Mose Vincent. Greenwell’s career as a first-call sessions player began at Sam Phillips’ Sun Studios and led him to take up residence in Nashville in the ’80’s. 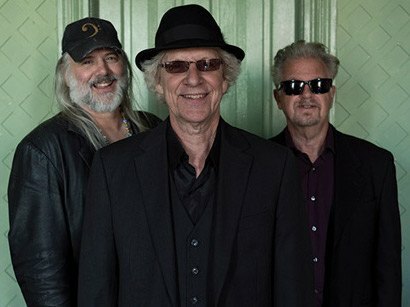 Greenwell came to national attention in the band Blues Co-Op (with Allman Brothers guitarist Warren Haynes). 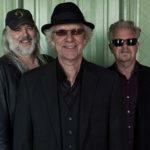 It was in Nashville that Greenwell began a long association with Allman Brothers keyboardist, singer and producer Johnny Neel, a partnership that continues to this day. Greenwell came to New Orleans in 1981 for an engagement at the now legendary (and defunct) Old Absinthe Bar and decided to stay. Since that time, he has shared stages with Snooks Eaglin, Marc Adams, Eddie Bo, “Big” Al Carson, Brint Anderson, Jumpin’ Johnny Sansone, Coco Robicheaux, Willie Lockett, John Carey, Bruce “Sunpie” Barnes, Kermit Venable and BeauBassin, Kipori “Baby Wolf” Woods, Bryan Lee, Timothea, Walter “Wolfman” Washington, Jeremy Lyons, Spencer Bohren, George Porter, Jr., Waylon Thibodeaux, Rockin’ Dopsie, Jr., Chubby Carrier, Blue Floyd, Mother Blues, Lenny McDaniel, Irene Sage, Tommy Malone, Tim Green, Jimmy Page, Eugene Carrier, Tom Worrell, and many others in the areas of blues, jazz, Cajun, Zydeco, funk, and country. 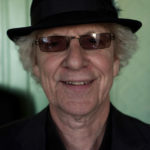 In addition to fronting his own band, Greenwell is best known as the replacement for Lee Oskar in the seminal band WAR with Harold Brown, BB Dickerson, and Howard Scott (currently recording and touring under the name The Original Lowriders for legal reasons). Greenwell wrote and produced a popular harmonica course in 1984. 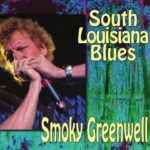 The updated version remains in demand at music stores in New Orleans, Nashville, and other cities where it is available, and on Greenwell’s web site smokystore.com. Smoky’s Beginning Harmonica Course has sold approximately 22, 000 copies and is used in schools as well as by individuals. Greenwell is frequently sought out by blues harmonica aficionados seeking private lessons. Greenwell spends his time in New Orleans while not on the road. He is available for session work, performances, and private lessons. Greenwell has nearly a dozen CDs to his credit: Smokin (1993), Smoke Alarm (1995), Blowout (1998), Premium Smoke (2000), Smokin’ Christmas (2002), Classic Smoke (2005), Between Iraq and a Hard Place (2008), 99% Blues (2012), Smoky Greenwell’s New Orleans Blue Jam: Live at the Old U.S. Mint (2015), and South Louisiana Blues (2016). 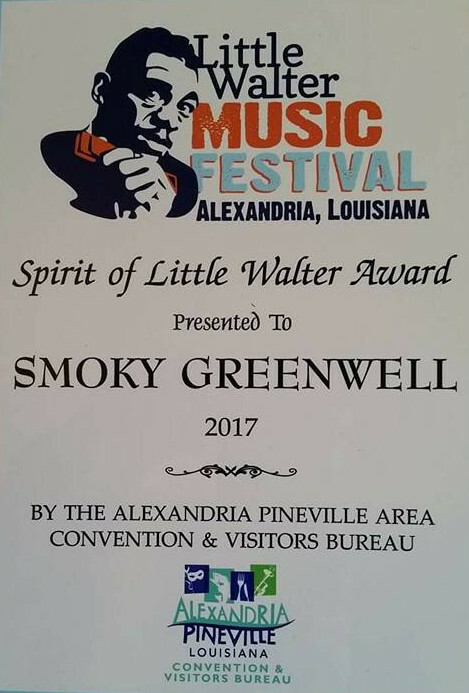 Smoky has been playing many gigs around New Orleans, including the 2017 Creole Tomato Festival, and was recently awarded the 2017 Spirit of Little Walter Award at the Little Walter Music Festival in Alexandria, LA for his band’s performance and teaching a harmonica seminar (photo of award: https://goo.gl/2cihdR ). Smoky also performed with Warren Haynes, both in New Orleans at the Last Waltz Tribute at the Saengar Theater, and with the Last Waltz Band at Warren Haynes’ annual Christmas Jam 2016 in Asheville, NC . 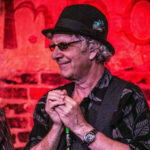 His latest CD, South Louisiana Blues, received honorable mention including Top 50 Louisiana CD’s of 2016 according to Offbeat Magazine. 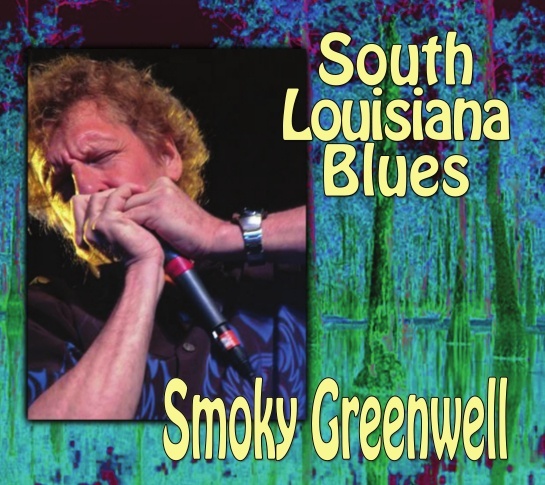 In early 2017, Smoky Greenwell produced and hosted a three-month series of blues shows at the Carver Theater with more than 70 of Louisiana’s best blues artists, including Little Freddie King, Walter “Wolfman” Washington, and Grammy-winners Alvin “Youngblood” Hart & Chubby Carrier.